Yet another remake of a classic show. 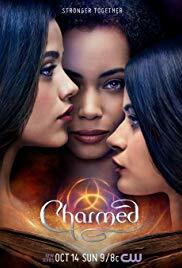 Well, we should not be too dewy-eyed over the original Charmed (1998) . It portrayed the demons as People of Colour who lived in a hot place down south - obviously coded references to Latino immigrants who want to live in California. Since the original show was about a race-war fought from the perspective of White terrorists, this new version is a race-swapped version of the same thing. Two Latina girls live with their mother ( Valerie Cruz ). The bad news is, they lose the mother. The good news is, they discover they have a secret older sister. The trio also have a secret destiny. A creepy white man insists they are Witches, and he is a magical guardian called a Whitelighter. The show has an unpleasant air of Social Justice propaganda. For example, the new sister's boss has been accused of sexual harrassment. We know he must be guilty, because he tells her that she has a pretty blouse. When the sisters say this to each other, it is treated as them just giving emotional validation. Anyway, the old man is white so he must be up to no good. Another white male, who believes the old man is innocent until proven guilty, is likewise portyrayed as a villain. The original show may have had its problems, but it treated its protagonists as empowered women instead of a bunch of privileged victims. At the end of the previous episode, in a cliffhanger structure taken from Alias , the Latina girls tried using a ouija board. Here it is called a spirit board, so as not to breach copyright. They want to make contact with their mother ( Valerie Cruz ). Whoever is on the other side tells them not to trust their Whitelighter, Harry Greenwood (Rupert Evans - Man In The High Castle ). The eldest sister discovers that a cow-orker has died mysteriously. Her sisters investigate, and discover a demonic entity was responsible. It jumps from body to body, and possesses a woman who was trapped in a coma. The youngest sister wants to ingratiate herself with the Kappa sorority. She agrees to host their halloween party at her family's house. Hopefully any real-life witchery will be taken as halloween pranks. The lesbian sister has her hands full. Her lover, the lady cop Detective Niko Hamada ( Ellen Tamaki ), is grieving because of her lost friend. The Elders have decided the easiest way to maintain the veil of secrecy between the mortal world and the world of magic was to frame the dead man and make him seem to be a serial killer. Naturally, the lesbian cop decides to investigate further. Unfortunately there is a shape-shifting demon on the trail as well. The scientist sister meets her lab's new sponsor. He is Mr Kane (Craig Parker - Legend Of the Seeker ) of Morningstar Industries. Yes, a rent-a-villain with a creepy character name. It seems like this show is now following the Aaron Spelling traditions of its roots. The scientist sister has more important things to think about. Her cow-orker, the one she wanted to date but never got round to because she lives in the #MeToo no-workplace-dating era, has now got himself a perfect girlfriend. But if the girlfriend is too good to be true, she might actually be a soul-sucking succubus! The lesbian sister has her hands full. Her lover, the lady cop Detective Niko Hamada ( Ellen Tamaki ), has been written out of the story. Well, this subplot was a LBGT version of the TJ King storyline from the original series. Some people might use it as an anti-gay twist, but it is just an updated version of a straight storyline. The sorority sister has been expelled for her actions at the Halloween party. Her former friend is so upset that she inadvertently awakens a hostile spirit. Two of the sisters go back in time to 1989, when the spirit died and became a ghost. They take the opportunity to spy on their mother ( Valerie Cruz ), when she was preganant with her first daughter - the one she abandoned. The scientist sister is curious about her own heritage. She visits a Voodoo priestess, and asks for help. All she gets is enough vague answers to further the plot a bit. Turning back time may have saved the lesbian cop, but the butterfly effect means that the lesbian sister is now unemployed. The whitelighter tries to get her an interview for a new job. The girls are visited by a satyr, a drunken goat-boy. He was guardian of a fragment of a magical scythe. His part was stolen by an evil entity. The scientist sister reveals the magical key she discovered in the previous episode. It was their mother's legacy - it turns out she was one of the other guardians. The ex-sorority sister has a positive development in her love life. But as always, this may be too good to be true. The scientist sister has been promoted because all the old white men have been killed off. She promises her boss, Dr. Julia Wagner ( Rya Kihlstedt ) that she will make cost savings through efficiency. The student sister gets offered an internship with her boyfriend's father. She prefers to avoid nepotism, and goes for a different internship.